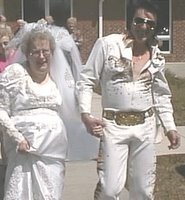 LDeSsays.com: 'Til Death Do WHO Part? 'Til Death Do WHO Part? Jeff Lindsay, who operates one of our favorite LDS resources, observes in a post on marriages made outside of the temple: "Of course...temple marriage is best." True, that. But temple marriage is also inevitable. It's a bit silly of Latter-day Saints, is it not, to proclaim the superiority of temple marriages over secular ones that "end at 'death do we part.'" If we honestly believed that to be the case, we'd have no need of vicarious sealings, now would we? Brother Lindsay is exactly correct when he calls for Latter-day Saints to "support and nurture every marriage among us and help our members and their non-member spouses, if such be the case, find joy and fellowship in our midst."